Perfumes I count on to fill this role include Guerlain Vol de Nuit, DelRae Mythique, Caron Nocturnes, Bois 1920 Sutra Ylang, and, to some extent, Chanel No. 5. If I had a bottle, Hermès Eau des Merveilles would join the line up. For someone who loves amber, Aedes de Venustas Cierge de Lune might be a solid choice for this kind of “aura” fragrance. Perfumer Fabrice Pellegrin developed Cierge de Lune, and its notes include Madagascan vanilla absolute, hedione, pink pepper, black pepper, ambrox and suede accord. It’s a fairly linear fragrance that unrolls an all-day, plush, layered, woody-amber-vanilla glow. Wearing it is like pulling on cashmere socks in the morning. You set it and forget it. Cierge de Lune will purr each time you catch a whiff from your scarf or reawaken it while doing dishes in warm water. It’s on the job. On first smelling Cierge de Lune on a tester strip at Fumerie, the first image that came to mind was of a satinwood side table. I smelled amber, vanilla, and wood softened with a dusting of finely milled powder, and the combination was almost visually golden. But, like satinwood, the fragrance was intriguingly three-dimensional. Sometimes amber shimmers, but Cierge de Lune glowed. It was radiant yet intangible, like body heat left behind in bed or — okay, this is less romantic but maybe more accurate — the puff of heat that blows past your neck and cheeks on opening the oven. After wearing it on skin three days, my initial impression stayed true. And, man, does Cierge de Lune go and go. If you value persistence in a fragrance, you’ll like this one. However, the flip side of a persistent scent is that it can be fatiguing. It can wear you out. And some notes, like amber and vanilla, have to tiptoe a tightrope to avoid falling into nausea. To me, Cierge de Lune is sheer enough to succeed, but others might be more sensitive than I am. One more note: Cierge de Lune’s texture reminds me of that of Donna Karan Cashmere Mist and Laura Mercier L’Heure Magique. Despite its vanilla absolute, it feels a bit chemically induced. That might be what gives it its softness and glow, sort of like how fleece robes are so soft, yet have nothing to do with actual fleece. Wearing a fleece robe, you might luxuriate in its cuddliness, but you're never fooled that you're wearing anything but recycled soda bottles. Still, all in all, if you’re looking for a well-crafted, warming, vaporous, all-purpose scent, and you like amber and vanilla, be sure to put Cierge de Lune on your list. 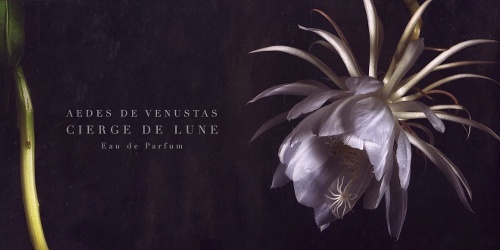 Aedes de Venustas Cierge de Lune Eau de Parfum is $245 for 100 ml. 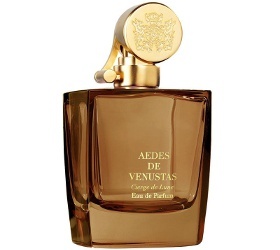 For information on where to buy it, see Aedes de Venustas under Perfume Houses. Hi Angela and happy 2017! Great to see your take on Cierge de Lune. It was on my list of favorite fragrances in 2016 and if someone asked me to narrow my choices to top 5, Cierge de Lune would be there for sure. For me it’s a plushy perfume, a tad more floral than vanilla. It makes me swoon when I smell it and I have to admit that I spray it with abandon since I have my own bottle! “Plushy” is the perfect word for it! And Happy New Year to you, too! How different is it from Ambre des Merveilles? Not that I am feeling post-holiday broke or anything, but AdM is about half the price. Oh, that’s an excellent question! I don’t have a sample, so I can’t try them side by side, but anyone seeking an everyday amber probably should. My instinct is that the Cierge is more pillowy and lasts longer, but sampling them both would be smart. Angela, your description of the texture seeming chemically induced is spot on, for me. I loved Cierge de Lune at first sniff, but on subsequent (and more lavish) wearings I’ve found that it has a certain indefinable something that bothers me, and that’s what it is. It *feels* weird in my nose, in that way that only certain aromachemicals do. I’m not at all opposed to synthetics in fragrance, but a few of them really bother me. Same here, and I’m guessing it’s the very thing that lends persistence. Fragrance houses probably tire of hearing “but it doesn’t last,” so they’ve found something that wears like teflon on some of us. Cashmeran sometimes feels that way to me. It’s lovely and has a nice texture, but it just doesn’t feel like something I want on my body as a primary note. You describe it well. I had a hard time pinning down just what it was that felt manmade to me (like you, I have no problem with aroma chemicals!) but something didn’t sit right. Per hour of wear, it’s a good deal! But I understand completely what you mean. And you didn’t sound a bit cranky to me. This scent is very quiet on me and I don’t get the synthetic vibe, fortunately. It is an airy floral vanilla on my skin, not really what I would describe as ambery. I have a FB and plan to wear it a lot in the coming months after Lucasai suggested wearing it in winter. I previously thought of it as a summer scent because it’s not sweet or suffocating in the heat like other vanillas. I think it would be a great scent for fall and winter. It’s so warming! It’s interesting that two small businesses happened to decide to launch night blooming cactus fragrances last year! I have to say, they both sound a bit disappointing in comparison with the inspiration. I know! And they’re such amazingly different fragrances, too!